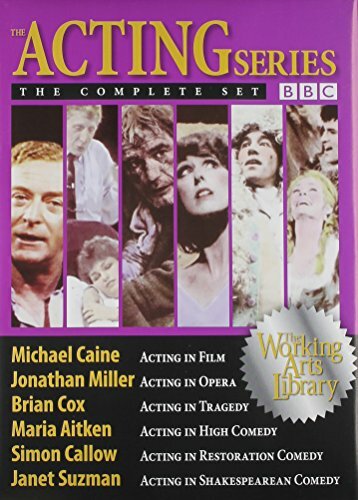 The BBC Acting Series: The Complete Set (Six DVDs) Applause Books Series DVD Written by Various Authors The BBC Acting Series has surpassed all other video acting programs in its influence on the acting profession and in the high standard it has set for arts education. While each program is targeted toward a particular realm of acting, an abundance of general wisdom is offered in each, which easily applies to a diversity of acting challenges. This specially priced 6 DVD set includes all six titles in this stimulating landmark series: Michael Caine's Acting in Film; Simon Callow's Acting in Restoration Comedy; Janet Suzman's Acting in Shakespearean Comedy; Brian Cox's Acting in Tragedy; Jonathan Miller's Acting in Opera; and Maria Aitken's Acting in High Comedy. Each DVD is available for purchase separately as well. 6 hours total running time. If you have any questions about this product by The Working Arts Library/Applause, contact us by completing and submitting the form below. If you are looking for a specif part number, please include it with your message.